Little Tikes Commercial offers a range of playground equipment in Canada, including design services for customers. As one of the highest standard options for playgrounds, Little Tikes Canada is your choice when you want equipment that is engineered for durability. Custom playgrounds. When you have a specific vision for your play space, finding the right pre-made equipment can be a challenge. Little Tikes Commercial has a design team that can help you make your vision a reality. Theme playgrounds. Themes, such as fairytales, forests, castles and others create a cohesive look for your playground and spark children’s imagination. Theme playgrounds are also great for social development, since they encourage children to play different roles. In a train-themed playground, for example, one child may act as a conductor while others act as passengers. This kind of play lets children learn how to agree and create roles. Sensory play equipment. Children benefit from learning with all their senses, and Little Tikes commercial playground equipment delivers. It is designed with bright colors, different textures and sounds. Some Little Tikes play structures also appeal to the kinesthetic sense by letting children explore different types of movement. Inclusive playgrounds. An inclusive Little Tikes playground in Canada goes beyond accessibility and allows all children to play on the same playground. Inclusive playgrounds are designed to let children of different abilities play together, so no one is excluded. Separate playground components. Little Tikes playground equipment can be purchased as part of a complete structure, or you can buy individual components, such as slides or swings. 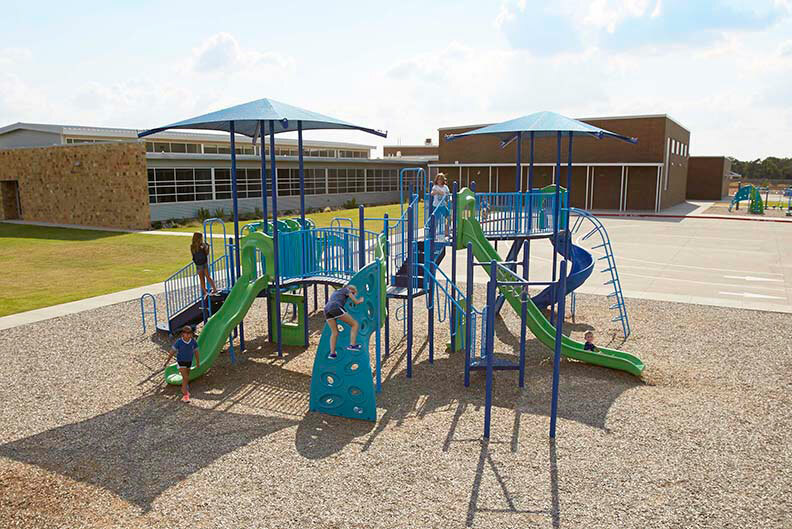 This allows you to customize your play area, upgrade an existing playground or build your recreational area in phases. Want to learn more about our Little Tikes Commercial equipment? Get a custom quote today! If you’re looking for quality playground equipment engineered for safety and that can stand up to Canadian winters, contact Little Tikes. With a range of equipment and a first-rate design team, Little Tikes can help you build the play space you’ve always wanted. Get a free quote today!